Rabbits can and do learn to preform tricks on command. Training rabbits is a bit differently then a dog. Rabbit training is more like training a cat. Positive reinforment and treats are a must for rabbit training. Repetition is necessary when training. The person training the rabbit will need to be very patient, fair and just with the animal. Usually once the rabbit learns the first behavior, that is has learned to learn, it is easier to train any other behaviors and or tricks. A Trick Prop can be a stick from a tree or a fancy wooden human child's piano with a bench. Many tricks need props, others do not. Props do add zazzle to your tricks for audiences to see. Props can make a very easy trick look like your rabbit is a professional. It is all in the presentation. You of course can run out and buy all types of trick props new and spend all kinds of big money on them....or you can get them for next to nothing from Thrift Stores, Garage Sales and in your own basement. A stick can be jumped over or run under or a few stuck into the ground for weave polls and on and on. But face it, the stick as close to nature and as "green" (new "catch word") as it can be, is not the prettiest or the most eye catching trick prop. So each time you go to a Garage Sale or to the Thrift Store or in a Dept Store Toy Dept. keep your eyes open for not only items you can use to train your animals. Rabbits come in many sizes and so do keyboards and other props. Don't buy a German Giant sized toy keyboard for a Dwarf Hotot. You can buy Hula Hoops that are made for humans to use for your for your rabbits to jump thru, but it might fancy the trick up a bit if you cut that same hula hoop down to a smaller size for a smaller rabbit. you might find animal training books, nice collars, leashes, crates, kennels...you just never know what the next Garage Sale might have...happy shopping. Do you have a child's toy piano? If not, check Garage Sales and Resale Shops (I have bought several for $0.25 - $5) This is an EASY trick to teach a dog, but will take more time training a rabbit. First you would start by just holding the rabbit and having the piano just in front of you. With a sliver of carrot, hit a piano key and treat the rabbit, over and over and over again. Now, when I say over and over I do not mean all in one sitting, but over several days and with some animals weeks, longer with other animals. 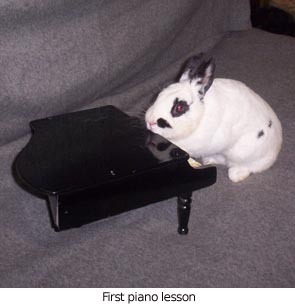 Set the rabbit in front of the piano (now this piano needs to be below the rabbits eye level, so buy your toy piano according to your animal's size). Say "Play Piano" and as you say it take the rabbits paw, as before, then set it gently but firmly enough to hit a piano key, give the rabbit a treat right away. As the trick progresses, say only "Play Piano". Practise, Practise, Practise. Anytime you are in a bad mood or if you start to get frustrated with any animal during training STOP and put the animal away for the day. Come back when you are in a better mood. Sitting up is a normal behavior for rabbits. This means it will be easy to teach your rabbitt to do on command, or at least for a treat. Hold a small treat in front of your rabbit and when it sees or smells the treat raise it slowly so that the rabbit has to raise it's head and then body off the ground to receive the treat. Use a word like "up" or "sit pretty" while moving the treat slowly upward. As soon as the rabbit "sits up" give verbal praise and the treat. After a few sections have the rabbit wait a moment while in the sit up position before giving the treat. Always give the same verbal command while training and later after the trick is learned so that the rabbit will learn to sit up on command. We have found that a kitty litter box works well for rabbits. Hospital pans are great for smaller breeds. You can buy pet litter pans in a pet store or pet dept. You can use kitty litter, pine shavings or sand as litter for your rabbits. Sand will make a mess, it is the best liked by rabbits but is the least liked by humans, but it is cheap. Confinement and supervision are the key to training your rabbit to use the litter pan. If a rabbit is allowed to urinate and defecate wherever it likes from the beginning, it will be much harder to train the rabbit as it becomes older. At first, keep your rabbit in a small cage with a litter pan with litter in the litter pan. Place a litter box in the cage in the back corner that your rabbit has chosen to "potty" in. Your rabbit may start using the box straight away, or it may pick another corner of the cage to use as a toilet. If your rabbit starts doing this move the litter box to the area your rabbit seems to prefer, even better, ad another litter box so that both corners are covered. Once your rabbit is using the litter pan in the cage, allow the rabbit out of the cage in a small area. Leave the cage door open with the litter box in the cage where the litter box will be placed in the future. Accidents will happen, and you can not punishment a rabbit. If you catch your rabbit urinating calmly and gently take it to the litter box immediately. If you do not catch the rabbit just clean up the mess and watch your rabbit a little more closely next time. The key is to get your rabbit to the box before it goes. Taking your rabbit to the litter box every 10 - 15 minutes during playtime can also be helpful. Your rabbit will soon learn to use the litter box and you can increase the amount of time out of the cage and increase the amount of area that your rabbit can be in. You may need to provide more litter boxes as you allow your rabbit access to more space. If your rabbit repeatedly chooses one place in the room to go potty, consider putting another litter box there. Establishing a routine with your rabbit will also help. Once in a while a rabbit will "regress" in it's litter box training. Start fresh from the cage with a litter box again, the process will go faster this time. Leash training a rabbit is fun and still a novelty, however, few rabbits will behave on a leash like a dog that will trot obediently by your side and sit when you stop walking. Most rabbits will stop often to look around and eat a bit of grass. You will be surprised how many people will take your picture while you are out walking your rabbit. Leash training for rabbits requires the same basic principles as any other kind of rabbit training; proper equipment, patience, patience, more patience and positive reinforcement. Because rabbits are intelligent, sensitive creatures, you should never use force in training. Instead, you must show your rabbit what you want it to do, then persuade it to perform the behavior. During training, you may use food rewards; later, you will phase out the treats entirely. Be prepared to spend a lot time training your rabbit to walk on a leash. The rabbit may need several days to adjust to the harness and leash, and it will take even more time to teach the rabbit to walk with you on the leash. Spend 15 minutes once or twice a day everyday training your rabbit. Before you begin, you'll need proper fitting, safe equipment in good repair to ensure that your rabbit cannot escape or become injured. Because a rabbit's neck is more delicate than a dog's, collars are not appropriate for leash training or for walking, no matter how pretty they look. Buy a sturdy, lightweight figure-8 or figure-H halter with one strap that passes around the rabbit's neck and another strap that passes around the body behind the forelegs. Buy the correct size for the breed/size of your rabbit. The harness should fit securely without being too tight; you don't want to choke your rabbit, but you don't want the rabbit to be able to back out of the harness either. 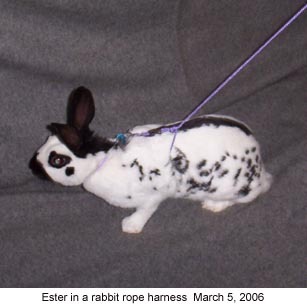 A metal ring in the center of the top of the harness allows you to hook the leash above the rabbit's back. You can find rabbit harnesses at most pet stores. A cat harness will fit most breeds of rabbits. Wear flat soled comfortable shows. Wear clothes that you can move freely and bend over easily in. Choose a lightweight, short leash, no longer than 5 or 6 feet, with a handle that loops around your wrist. If danger threatens, you'll want your rabbit close by so you can quickly pick it up. Start training the rabbit indoors or on your clean driveway or sidewalk. Do not start your rabbit in the grass. Rabbits love to eat the grass and that is all it will be thinking about. When first harnesses your rabbit may fall over to one side and refuse to move, or it may even lie down. In either case, don't worry. Offer the rabbit a treat and wait. When your rabbit stands up and walks toward you, give it the treat. Leave the harness on for up to 10 minutes at a time, two or even better, three times a day. Once your rabbit is comfortable wearing the harness, attach it to a leash. Never leave a rabbit unattended in a harness and/or leash. Your rabbit may balk, fall down or try to run away from the constraint of the leash. Talk gently to the rabbit and always remain patient and gentle. When the rabbit finally stands up and walks with you, have the food rewards ready. With the leash in your hand, move one step forward, gently tug the leash, and show your rabbit the food reward. If the rabbit follows, reward the rabbit. After a few days of successful following or even if the rabbit leads you, begin gradually to phase out the food reward. When you walk your rabbit, it may be a good idea to loop the leash around the opposite wrist that the rabbit is walking on and control the leash with the other hand. For example, if your rabbit is walking on your left side, hold the leash in your right hand and control it with your left. That way, if there's a problem, you may grab your rabbit with your left hand and keep the leash secure with your right hand and wrist. 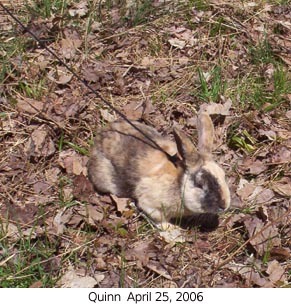 Out door outings can be difficult and dangerous, and owners must take many precautions to ensure that their rabbits are safe while out on the leash. It is not recommended to walk rabbits near streets and highways, or where aggressive animals might jump out and attack. Quiet, well-maintained parks, yards and other secluded areas are ideal places to walk a rabbit. A fenced in area would be the best. Never take a pet rabbit on a leash to a dog park. Dogs can/do see your rabbit as prey. Walking a rabbit is rarely like walking a dog. Walk slowly, have fun, and your rabbit will have fun, too. Be prepared for much stopping and starting. If your rabbit is fearful, don't insist on walking very far or staying outdoors long, just stand and let the rabbit look around and eat a bit of grass, however, don't let your rabbit nibble your neighbor's grass. You never know what parasites or pesticides have been used in someone else's lawn.